Damascus, the capital of Syria, is a more than 3,000-year-old city, celebrated as a �ePearl of the Middle East.�f Islam, born in Arabia in the 7th century, rapidly subjugated the whole Middle East and then the Umayyad dynasty took power of this empire in 661, making this centrally located city the capital. The Great Mosque that Khalifa Walid I (r. 705-15) constructed at the heart of the city early in the 8th century is the extant oldest mosque in the Islamic world, being dubbed �eUmayyad Mosque�f because it symbolizes the Umayyad Empire. Although it was twenty-four years ago that I visited Damascus for the first time, it was 6 years later in 1986 that I went there to take photographs of its historical buildings thoroughly. When I arrived at the Great Mosque with eagerness bringing a camera-bag and a tripod with me, I was bewildered by the fact I was forbidden to take pictures there. Being not able to believe it, I asked a person to negotiate with the custodian of the mosque and got the likely reason that I was supposed to be a journalist owing to my equipment. Despite its enormous scale, this mosque has quite a comfortable inner space to sit down or lie down on its carpeted floor, looking up at the magnificent interior space and its marble columns, many citizens consequently loaf around lying scattered here and there even in daytime. The custodian probably banned me from taking pictures with apprehension if such a slack spectacle is photographed and published abroad, it would surely diffuse the impression of Syrian people to be very lazy. Persuading him that I was not a journalist but an architect to study historical buildings, I could eventually take pictures using the tripod. As this affair shows this mosque is one of the rare monuments in the world that have a human comfortable space coexisting with an architectural sublimity. This Umayyad Mosque becomes more interesting by learning its complicated process of formation. On this site there was originally a cathedral of the Byzantine Empire, the church of St John the Baptist. St John was the prophet who baptized Jesus Christ and whose head was cut off by the King Herod according to the story of Salome. It is this church of St John where his head was consecrated as a sacred relic in its crypt. The Umayyad Khalifa Walid ordered it demolished and a great mosque built on the same site. However, the architects in charge of this project didn�ft seem to destroy the church completely but dismantle it carefully in order to reuse the columns and arches (i.e. arcades) for the new mosque. 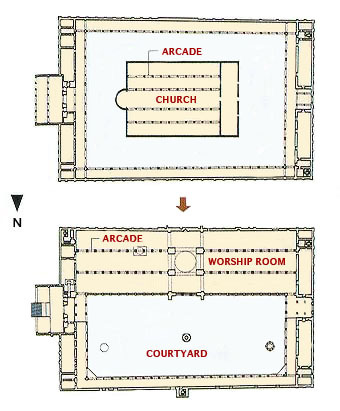 The church of St John had had a five-nave-plan with four rows of grand arcades, standing at the center of the site, turning its end toward the east. However, a mosque should be built in the direction of Makka, namely, toward the south from Damascus. The worship room of the new mosque was consequently set in the south side against the border wall, reusing the four rows of arcades inside it. Since they were disposed as two rows in the east wing and the other two rows in the west wing, the proportion of the worship room, including the central bay covered with a dome, was extremely oblong, which would become a standard model for many later mosques. The arcades�f marble columns were much older than the church of St John itself, taken from the ancient Roman Temple of Jupiter, which had stood on the same site before the church of St John. Over these excellent 6m long columns, high?rise semi-circular arches span continuously, and moreover smaller half-size arches span the top of them. The interior space with these enormous two-tiered arcades is quite spectacular, nevertheless it offers comfort to worshippers instead of an oppressive feeling; a mysterious great mosque in fact. Damascus as one of the capitals of the Byzantine Empire before the advent of Islam was the stage of great development of Byzantine arts including glass mosaics. This mosque too, succeeding to this tradition, was embellished with mosaics on most parts. On the facade wall of the central bay facing the courtyard is drawn by mosaics verdurous gardens, palaces, and a celestial paradise depicted in the �gQur�fan.�h However, due to the tenets of Islam evasive of idol worship, there are no humans or creatures in it, as if the Paradise is still waiting for the pious followers to come.